I love buying paperback collections. Like this one, which I found online last week. Just look at at all those gorgeous vintage paperbacks. Seriously, click on that link and look at them. I’ll wait. Twenty-eight volumes in terrific shape, for less than twenty bucks. Including four early volumes from Neal Barrett, Jr; three vintage Lovecraft collections (one of them The Dream Quest of Unknown Kadath); both Ballantine volumes of William Hope Hodgson’s The Night Land; one of Lin Carter’s better fantasy collections, Imaginary Worlds; A. Merritt’s The Moon Pool; a smattering of Ursula K. LeGuin, plus C.S. 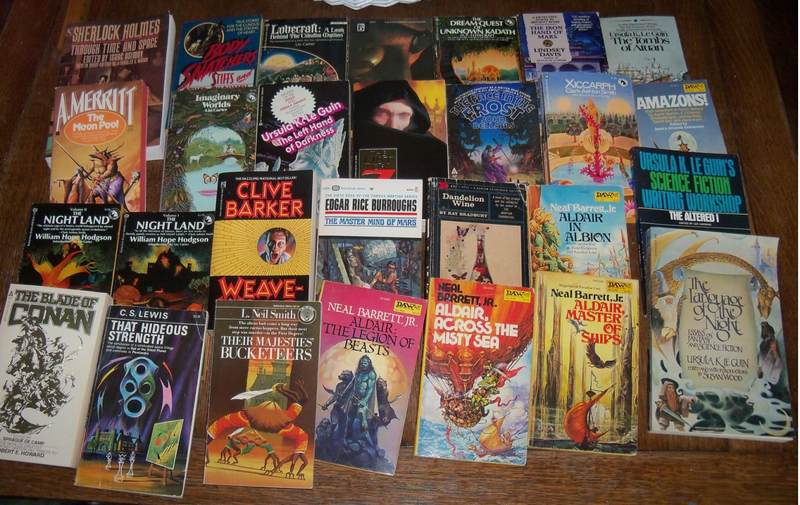 Lewis, Clark Ashton Smith, Ray Bradbury, Edgar Rice Burroughs, John Bellairs, and half a dozen more. There’s even a beautiful copy of Sherlock Holmes Through Time and Space, which I’ve lusted after ever since Violette Malan teased me with the cover in her article on science fiction mysteries last month. Man, I could just lay these babies down on the floor and roll around in ’em. Except that would probably dog ear the covers. They finally arrived today, carefully packed in tightly wrapped plastic, and I gently unwrapped them and settled in to examine my new treasures. 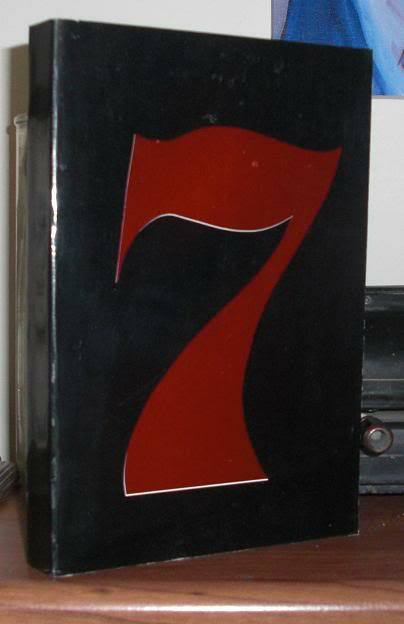 Many clamored for attention, but the one that practically jumped into my hands was The List of 7, by Mark Frost. 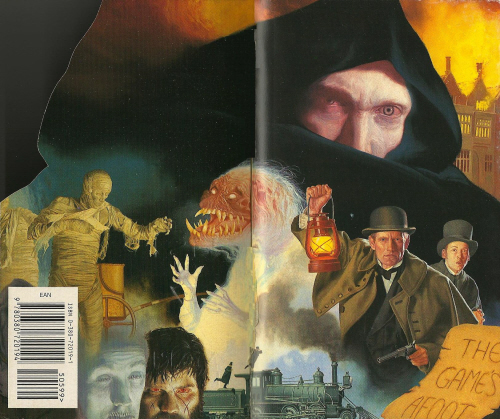 That’s the inside front cover above, complete with mummies, gruesome spectres, ghosts, a train chase, and — speaking of Sherlock Holmes — the words “The Game’s Afoot” scrawled on parchment (click for a bigger version). It’s more inviting than the usual collection of blurbs on the inside cover, you have to admit (although those are here too). Don D’Ammassa called The List of 7 the best book of the year in his review column in Science Fiction Chronicle back in 1993, and that was enough to get me to order a copy of the hardcover twenty years ago. The hardcover — simple and black, with a plain number 7 emblazoned on the cover — doesn’t have spectres, mummies, or train chases on the cover, and I eventually lost interest and filed it away two decades ago. The paperback, though… that’s a different story. I’m keeping this one in ready reach. Out of the mists of Victoria’s England, a diabolical evil has emerged with only one purpose — vengeance. Following a bloody London seance and in the aftermath of a terrifying supernatural contact, a good doctor finds himself the target of a malevolence born of the darkest nightmares. But with stalwart companions by his side — including an extraordinarily intrepid investigator — he seeks to expose a dastardly band of nefarious criminals and a chilling conspiracy aimed at the heart of England’s future… and instead unearths a crime far more horrible than murder and experiences an adventure beyond the limits of imagination. Despite appearances, the book doesn’t actually feature Sherlock Holmes. The protagonist is none other than a young Arthur Conan Doyle who — together with his inspiration for Sherlock Holmes, the brilliant and resourceful Jack Sparks — is drawn into a desperate struggle against a powerful and secretive group of Satanists in Victorian London. Mark Frost was a writer for Hill Street Blues, but he’s probably most well known for co-creating Twin Peaks with David Lynch. He’s written four other novels, including a sequel to The List of 7, The Six Messiahs (released in 1995), and two volumes of The Paladin Prophecy. The List of 7 was published in paperback by Avon in September 1994. It is 401 pages, with an original price of $5.99, and is still in print. A digital version is available for $6.99. The brilliant cover is by Daniel Horne. Seriously though, very happy for you and for these books. Glad they are ending up in hands that will cherish and take care of them. 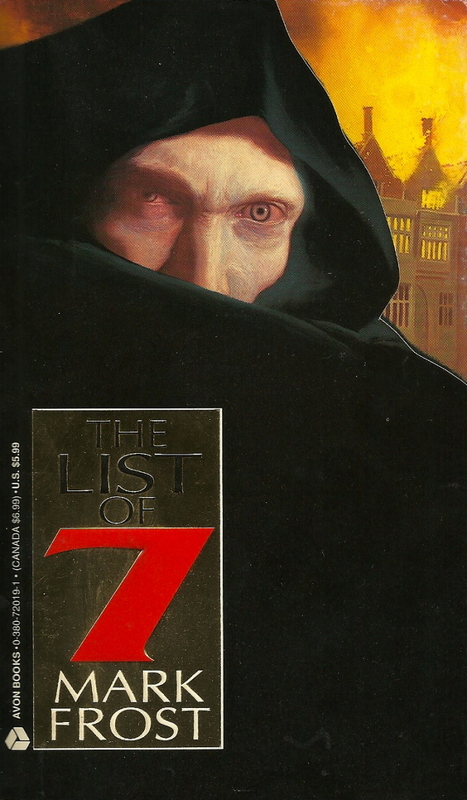 The List of Seven is probably the best book featuring Doyle (as opposed to Holmes). It would make a cool tv miniseries. The sequel is fair. Enjoy! There were rumors that Guillermo Del Toro was really keen on adapting it to film a few years back but he wasn’t able to sell the pitch to Hollywood. Oh well. You got a steal. I’ve seen the Clark Ashton Smith alone go for more that what you paid. Kudos. The Neal Barrett Aldair books are a blast of strangeness and adventure. Really, an author without enough attention from the average reader. Fine. Now I need to get the Neal Barrett Aldair books. And yes, that’s a fine collection there! Imaginary Worlds was interesting — Lin Carter’s theories about fantasy fiction, so it was a mixture of genuine insights and arrant nonsense, sometimes within the same sentence. > very happy for you and for these books. Glad they are ending up in hands that will cherish and take care of them. Thanks James. There are certainly plenty here that will fuel future VINTAGE TREASURES articles, that’s for sure. Starting with the Barrett and those Lovecraft volumes, I think. > It would make a cool tv miniseries. The sequel is fair. Enjoy! I’ve heard mixed reports on the sequel, THE SIX MESSIAHS, so my expectations for that one are lower. For one thing, it didn’t rate a Daniel Horne cover. Man, that guy is EVERYWHERE. Bummer we didn’t get a LIST OF 7 film, but personally I’m glad Del Toro spent his energy on PACIFIC RIM. That’s the only film I saw twice this summer. > You got a steal. I’ve seen the Clark Ashton Smith alone go for more that what you paid. Kudos. I think you’re right. I haven’t checked what copies are going for online, but I know the Ballantine Adult Fantasy titles in this collection — the Hodgson, the Clark, the Lovecrafts, and Lin’s non-fiction IMAGINARY WORLDS — are all highly collectible, and I rarely see them in unread condition like they are here. I’ll want to protect these copies by getting them bagged. But I’ll probably spend a few hours with them first. Okay, you made me curious, so I did a quick inventory of Xiccarph on eBay. I found six copies, with an average sale price of $33, and those in the best condition selling for over $60 (!). So yeah, seems like buying a collection was the way to go. Trust me, not every purchase turns out this way, so it’s always a pleasure when the books arrive in terrific shape and exceed your expectations. > The Neal Barrett Aldair books are a blast of strangeness and adventure. Really, an author without enough attention from the average reader. Hear hear! I first discovered Neal Barrett Jr. with his 1986 post-apocalyptic novel THROUGH DARKESS AMERICA, and THE HEREAFTER GANG, published by Mark Ziesing’s small press in 1991. He had a two-volume fantasy series from Spectra, too: THE PROPHECY MACHINE (2000) and THE TREACHERY OF KINGS (2001). He always seemed just a little too off-center to ever really find a commercial audience, I think. A shame. What’s that Ballantine(?) title in the top row that doesn’t have any text visible? Also, didn’t notice the Lindsey Davis — that’s probably my favorite mystery series. > and arrant nonsense, sometimes within the same sentence. I glanced over Carter’s Ballantine Adult Fantasy titles when I was looking up Xiccarph… 65 titles, all published between 1969 and 1974. That’s a book a month for over five years, an incredible accomplishment. With an output like that, I guess Carter was entitled to a few opinions on fantasy. The guy knew his stuff. The Ballantine Adult Fantasy series had some really great cover art, and it’s an excellent place to discover the fantasy authors that inspired much of the previous generation of writers. I used to see them quite often in used bookstores in the 80s and early 90s. Every once in a while I’ll come across a copy. Fortunately I have the set, plus about half of a second set. I’ll still pick one up if it’s in good condition and the price isn’t too high. A very common problem with that series was the spines tended to crease easily. Barrett is one of those unique voices who may not have had much commercial success but like Avram Davidson and R. A. Lafferty will still be read 100 years from now if there’s any justice. > What’s that Ballantine(?) title in the top row that doesn’t have any text visible? Believe it or not, some sources credit the cover to Vincent Di Fate (?!). When I get home I’ll check my copy. 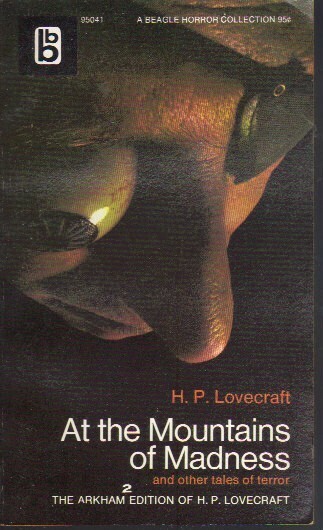 It’s part of the Arkham House Paperback series, reprinting their classic horror authors. 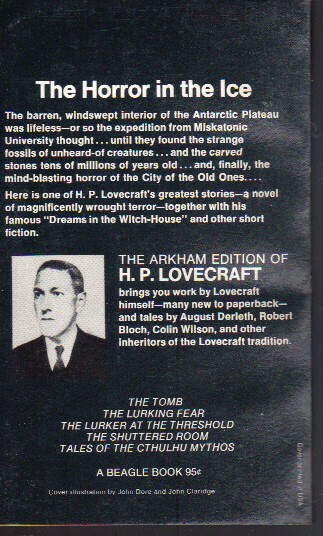 It’s by no means the first Lovecraft paperback; the 1960s paperbacks from Belmont were first; followed by Carter’s Ballantine Adult Fantasy titles; and then these. > Fortunately I have the set, plus about half of a second set. Wow! That’s a substantial collection you have. > I’ll still pick one up if it’s in good condition and the price isn’t too high. I’m the same way. They’re hard to resist at a good price. I tell myself I can always find friends to give them too. Indeed! I adore both Davidson and Lafferty, and would add Peter Beagle to that list of grossly underappreciated fantasy authors. Yeah, Barrett writes just enough off-center to miss out on the mainstream. So it goes. Through Darkest America and its sequel are among the bleakest books I’ve read. I think they make McCarthy ´s The Road look cheery. As to The Prophecy Engine it’s just been added to the review pile. John — Thanks! I hadn’t seen that cover before. And I love me some Ballantine Adult Fantasy — I picked up some random titles (Poseidonis and Hyperborea in particular, plus some of the Carter anthologies) at the local used book store in Austin, MN, back in the 1980s — only later did I realize that they were actually part of a series, although I think I’d been recognizing the cover art style. I also have a full set and am (very, very gradually) working on my second read-through. Lin Carter introduced me to some truly great stuff and for that I’ll always be grateful. I was fortunate that when I was in graduate school in the late 80s/early 90s in Denton, TX, that there was a fantastic used book store which got in most of a set and put them out in the general sff books. This was before they set up a collectibles area under lock and key. From that point, I only had a few left. I’d missed out a few years earlier when a used book store in Abilene closed. They had many of the titles. Since I didn’t live in Abilene, I wasn’t able to pick them up at my convenience.